It's...The Talk of the Town! "It's...The Talk of the Town!" 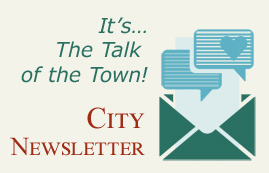 is the City of Pembroke's monthly newsletter. In July of 2013, we began providing our citizens with an inside look on projects, events, and important news. The response has been wonderful! Please take a look at our current and past issues by clicking the links below. Your opinion is welcomed by emailing info@pembrokega.net.